Rescue teams are composed of six, or not less than five men, the majority of whom should hold a certificate for first aid. The captain is usually a fireman or other official, and the leader should posses a fireman’s certificate. In this district (North Staffs) it has been the custom for the captain to bring up the rear of the team, on the principle that, as he is responsible of his men and their apparatus he should have them always in his site when travelling as well as working. The vice-captain is the leader, and walks first. He should hold a fireman’s certificate because it is hid duty to examine the roof and sides and to test for gas. Should he notice anything that is not as it should be, he halts the team, and the captain comes forward to examine the place and make a decision. Rescue men understand that the captain of the team is in supreme command and they always obey his ruling in all circumstances. He must exercise his own discretion in cases of emergency and when in the gas zone he owns to no superiors in the matter of safety to his team. For this reason the men acting as captains, should be chosen with very great care and they should have a very great deal of underground experience. They should have the confidence and respect of their teams, so that their orders will be obeyed at once without question. All rescue men should be volunteers, and should be physically sound in every way. They should be between 22 and 45 years of age and of very calm disposition. A rescue man who shows signs of nervousness or excitability should be dropped out of the team as soon as this tendency is noticed. He is a danger to himself, but he is a larger danger to his comrades. When a nervous man is working in a foul atmosphere, his nervousness grows the longer he is in it. He begins to fancy that his apparatus is not in working order, and causes endless trouble to his captain and team, through their having to examine his apparatus for wholly fancied faults. It is impossible to reassure him and after a time he works himself into a perfect frenzy.In many cases, he becomes panic-stricken, makes a bolt for the exit, and in all possibility, tears his mouthpiece and nose clip off. In such a state of madness it is a physical impossibility for his comrades to restrain him, and in the struggle, which follows several of the team might be put out of action. This has happened on more than one occasion, so that a nervous or excitable man, no matter how enthusiastic he may be, should on no account be returned in a team. There are two systems of rescue brigades in operation in England, the permanent brigade, and the voluntary systems. 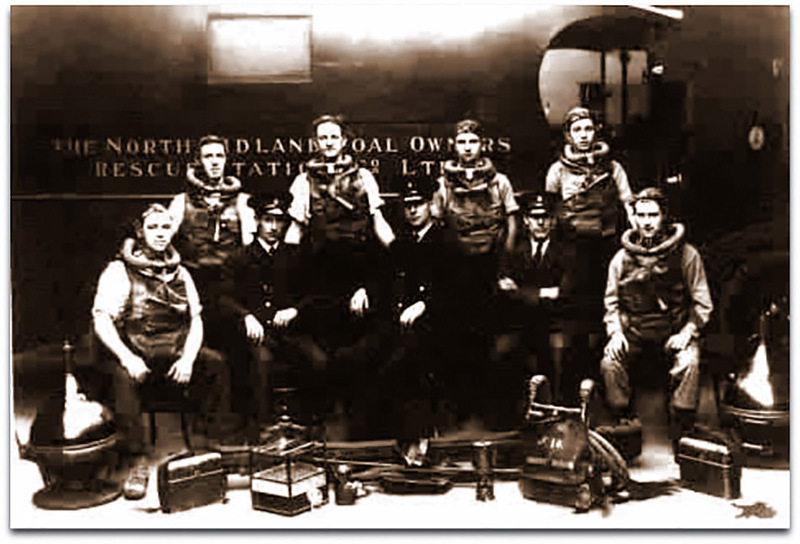 With the former, a staff of six, or if the total number of underground workmen served by the station exceeds 15,000 eight men are kept in permanent residence at the central rescue station in readiness for calls. In addition to these, men employed at the collieries are trained to act with the permanent brigade as the necessity arises. As regards the efficiency of the two systems there is a lot to be said for both. The writer considers, however, that the voluntary system is the better, for these reasons: Whilst admitting that a permanent brigade who are constantly in contact with the apparatus might, on the whole, be more comfortable wearing the apparatus through a greater intimacy with it, their muscles are not kept in the same state as those who are working underground every day; and when work, such as timbering, ripping or loading falls, has to be done the regular underground worker would be superior. A permanent brigade might indulge in gymnastic exercises at the station but they would only be of limited assistance for difficult work in a steep or low road. Further, in such large operations such as those following the Minnie Pit explosion in 1918 became necessary, the number of men would be too small, the work would proceed very slowly. 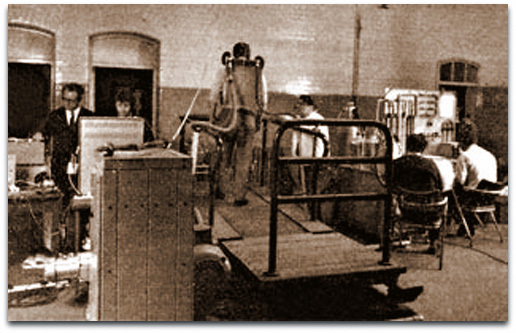 In one period of 24 hours 93 rescue men descended the Minnie Pit wearing apparatus. With the permanent brigade system, this would have been impossible, as the work is too arduous for a team to be sent down several times in a day. Fresh relays of men are constantly needed, and has been the practice in this district (North Staffordshire) not to allow if it can be avoided a team to descend more than once in 24 hours. At the same time the writer is of the opinion that in a district like North Staffordshire, there are too many rescue men for complete efficiency. There are upwards of 400 men kept in training, a number far in excess of what would be actually required. They each attend a practice once in three months at the central station. If this number were cut down by half, the men could attend eight times a year, instead of four and they would come much more familiar with the apparatus.